Teams of qualified technicians, trained in use of PPE, enables the quick and safe completion of projects. 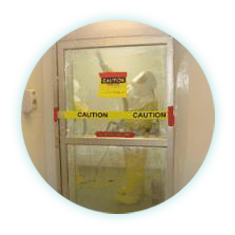 Surface Decontamination of rooms is performed by the fogging method to ensure adequate coverage and contact times. This procedure is performed to reduce contamination levels to acceptable limits in laboratory, production, animal or other spaces, which are inaccessible for routine surface decontaminations. It is often used as an adjunct either preceding or following regular cleaning and disinfecting procedures. Fogging decontamination is typically performed prior to initiating a totally different work program and/or to eliminate hard to find contamination sources within a space. Fogging decontaminations are most often performed within animal areas. They are also performed within mezzanine areas when there is potential contamination leaking from that area to a negative pressure clean space beneath. Fogging decontaminations may additionally be performed on laboratory equipment, devices, casework, ductwork sections, fans, exhaust stacks or other objects readily accessible. Decontaminated items may be removed for disposal and/or future reuse, due to space or laboratory demolition or renovations. Fogging, as performed by DRS, is typically performed using solutions that contain active ingredients either a peracetic acid/hydrogen peroxide mixture (such as Spor-Klenz or Actril) or chlorine dioxide (such as Clidox). The fogging is performed with B&G ULV fogging equipment, which quickly disperses chemicals at varying aerosol droplet sizes, and gives a high standard of coverage. The chemical will be delivered (line of sight) by the direct use of hand-held foggers or pneumatic pump sprayers.